Tools of the trade: eating in style | AngelaLTodd: let's get fun! Click this image to purchase these colorful wooden forks. Kids love having and making choices. They always want to have choices and to feel empowered. Who doesn’t? Sometimes, though, they don’t have choices about what they eat… like when they don’t want to eat the healthy meal you’ve made. Click this image to purchase these from Smileware — or check out her other cool cutlery. And when it does, offer your kids some fun alternative eating utensils. I’ve shared some recipes that sneak in healthy food, and I’ve written about some grocery store games to engage your kids in the family’s food choices. Add imaginative cutlery to your bag of tricks. From left: yogurt foil lids are meant to be used as spoons; K’nex, popsicle sticks, pickle fork, decorative butter knives, a Nuk tool for our sensory defensive eater (our seeker also loves it, even without dipping it in food! 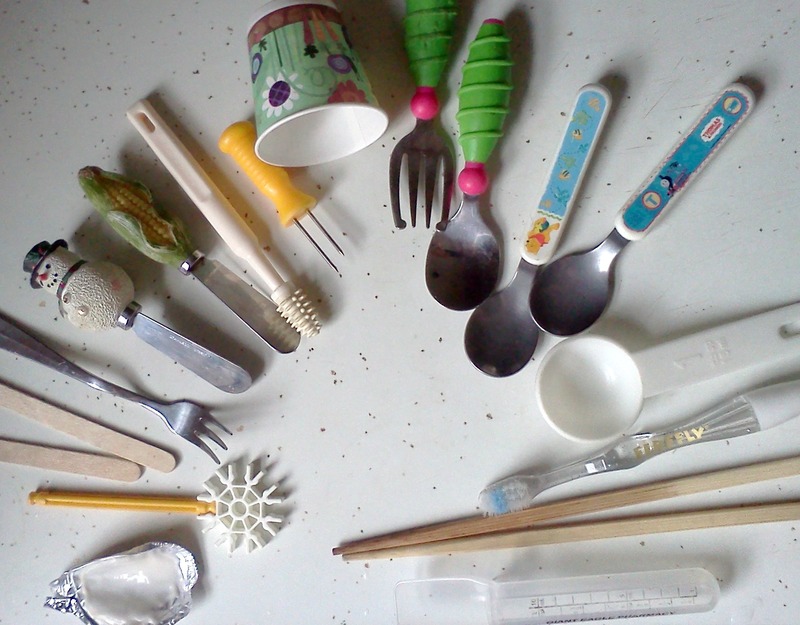 ), cob knobs, dixie cups, colorful cutlery, measuring spoon, toothbrush, chopsticks, and a medicine measuring device from the pharmacy. See what YOU have on hand. Even at 7 & 11, if I just set down a plate of pineapple or cheese cubes with a toothpick in each one, they are far more likely to eat. I’d love to hear about any crazy tools you come up with… please share them in the comments below, or join in over on Facebook! This entry was posted in Children, Cooking, DIY, experiments for kids, Fussy eaters, Kids, kids activities, Picky Eaters, Sensory activities, Uncategorized and tagged chopsticks, cutlery, feeding, finicky kids, food choices, fork, fussy eaters, healthy food, nuk, silverware, spoon by AngelaLTodd. Bookmark the permalink. I never thought about the TOOL getting in the way or helping with a picky eater. Great way to adapt and think outside the box on that one! Anytime you can turn food into finger-food, kids tend to eat it more. My kids would eat frozen peas in tiny little bowls set out on the counter while I was making dinner, just picking them out one at a time and crunching them. Behold! Veggies done before dinner even started! Love the idea of serving cheese and pineapple as finger food. Little tricks like this can take the stress out of getting good food into the kiddos so that you can concentrate on other things (like having fun together)! Thanks for educating us and providing us with such great ideas!